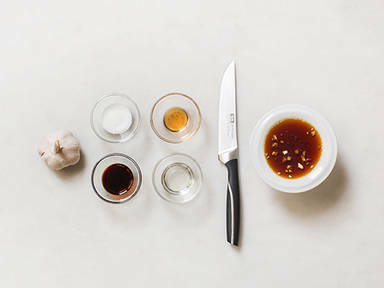 A basic garlic soy sauce is a perfect marinade for fish and meat, but also goes well as a sauce for asian dishes like spring rolls and noodle dishes. This recipe is so easy to make with ingredients you always have at home. Combine it with fresh chili or ginger to create new sauces. Cut garlic into pieces. Crush into a small bowl by using a garlic press. Add sugar and soy sauce. Add sesame oil to taste. Stir well to combine the ingredients. Set aside or enjoy! Cut garlic into pieces. Crush into a small bowl by using a garlic press. Add sugar, black rice vinegar and sesame oil to taste. Stir well to combine the ingredients. Enjoy!